Sarah Beauhall has more on her plate than most twenty-somethings: day job as a blacksmith, night job as a props manager for low-budget movies, and her free time is spent fighting in a medieval re-enactment group. The lead actor breaks Sarah’s favorite one-of-a-kind sword, and to avoid reshooting scenes, Sarah agrees to repair the blade. One of the extras, who claims to be a dwarf, offers to help. And that’s when things start to get weird. Could the sword really be magic, as the "dwarf" claims? Are dragons really living among us as shapeshifters? And as if things weren’t surreal enough, Sarah’s girlfriend Katie breaks out the dreaded phrase… “I love you.” As her life begins to fall apart, first her relationship with Katie, then her job at the movie studio, and finally her blacksmithing career, Sarah hits rock bottom. It is at this moment, when she has lost everything she has prized, that one of the dragons makes their move. And suddenly what was unthinkable becomes all too real…and Sarah will have to decide if she can reject what is safe and become the heroine who is needed to save her world. 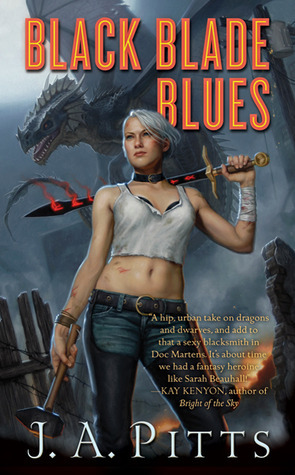 I've been having an awesome run with urban fantasy books, and now I can add this book to the list. It's awesome! Seriously awesome. Sarah Beauhall is a blacksmith by day and props manager at night. The night one of her swords is damaged on the set and she reforges it, her life changes. All of a sudden a dwarf won't leave her alone about the sword, and she starts to feel different. She can't seem to control her moods, or her anger, and seems to be making one bad move after another. She's also conflicted in her relationship. She likes being with her girlfriend, Katie, but can't seem to be comfortable with showing her true emotions in public. Many years of hiding her sexuality have made her full of shame and doubt. Something which threatens to ruin what could possibly be a great relationship. However, when she realises that dragons and magic might actually be real and everyone seems to want to either buy or take the sword away from her, Sarah can't ignore her destiny. OMG, what an amazing book! I was hooked from the beginning and found it hard to put down. This is an outstanding mix of urban fantasy, Norse mythology, and dragon lore. I loved how everything was mixed seamlessly, and left me wanting more. There's a bit of everything in this book, and I particularly liked Sarah as a narrator. She was brutally honest in her confusion, as she slowly changes and can't seem to do much about the starring role she's been cast in by fate. Oh, and the dragon confrontation scene was absolutely brutal in its violence. I loved it! Actually, I just preordered the mmp of the second book in the series because I can't wait to follow Sarah and her friends on this amazing adventure of hers.